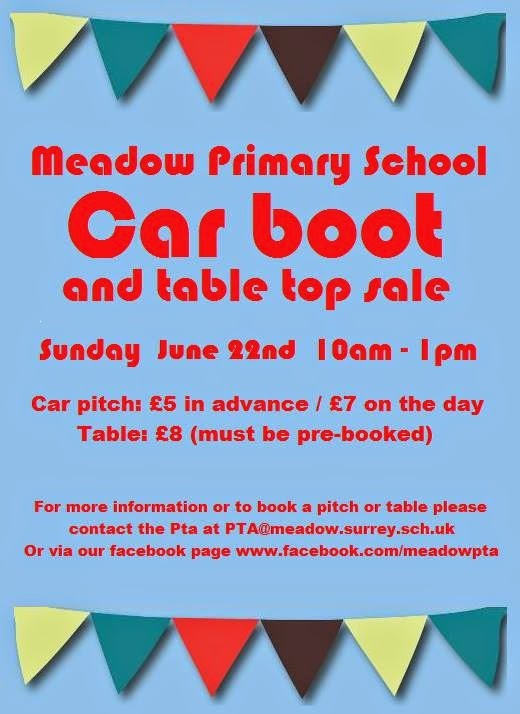 If your're in the market for a car boot or a table top then look no further than Meadow Primary School this Sunday (22nd June) from 10am 'til 1pm. Last year this event unfortunately coincided with a very wet day but they still managed a reasonable turnout. Luckily this year there is sunshine predicted for day so it should be positively bustling! There are still some table spots left. You can prebook one of these by emailing pta@meadow.surrey.sch.uk. However Kerry Dews who is organising the day told the blog that people could also turn up on the day and possibly get a spot if there are any left but it would be first come, first served. This is a great way to go along, get a bargain or get rid of your unwanteds, and help support your a local school at the same time.